Evangelist Steve Pelemoh famously known as Bro-Bro or Boro-Boro is a globally renowned Celestial Choir Master and gospel singer of repute who has released so many soul lifting albums in the last four decade. His songs are mostly philosophical and hard on those who dare to listen; spiced with good melody, message and philosophy, Boro-Boro is your best bet any day any time. Bro-Bro who started reining in the early 80s is also the only Celestial Church Choir Master who recorded the church’s hymn into 7 Volumes of album and released it into several parishes across the world. He is not only revered among the elderly members of the great church founded by Late Reverend SBJ Oschoffa but equally revered among the younger generations as well. 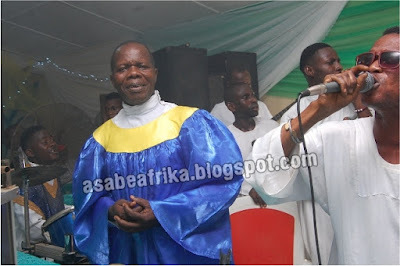 Today, Bro-Bro who is 65 has come off age with 46 years of his life used in the vineyard of the Lord as a choir master and music director; a guitarist, lyricist and choir director at CCC, National Headquarters, Makoko-Lagos-South West Nigeria. 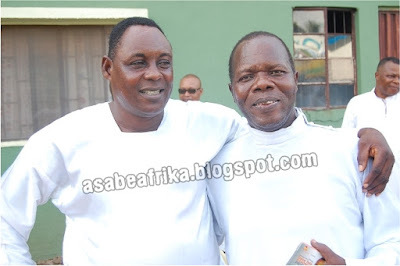 Boro-Boro remains one of the oldest gospel artistes of the Celestial fold after Evangelist Akin Adebayo and late Baba Ara. Last Sunday, November 15, Boro-Boro was the guest artiste at a 5 days revival which culminated into the 20th year’s adult harvest and anniversary of Celestial Church of Christ, (CCC) Elisha Parish, Nigeria cathedral under the leadership of Prophet (Dr.) Marcus Korede Oluwatosin Tibetan aka The Nostradamus of our time. After the harest, Bro Bro granted your Africa’s number 1 Celebrity Encounter blog Asabeafrika an exclusive interview where he talked about himself and why his songs are often philosophical and strong worded with message. Enjoy the exclusive encounter with Bro-Bro. Sir, you are one of the famous musicians in the Celestial Church of Christ who have been in the gospel music ministry for over two decades, how would you describe the experience? My name is Pelemoh Steve Bro-Bro I can tell you that it is by the grace that I received, the grace of Luli. I came into the Celestial fold when I was nobody and I will liken my self to someone who should have been sold off to buy a lantern but today, God has turned me into the lantern that gives the world light to see. I return the glory to the Almighty God, the God of Celestial Church of Christ, and the God of SBJ Oschoffa. The Celestial Church is a glorious church which God gave to the world through the late Prophet, Pastor, Founder Reverend SBJ Oschoffa of blessed memory. Those who are building the church, God called them, those who are equally destroying the church are also called by God and those who are uplifting the church, it is still this same God that called them and those dragging the church down are equally called by God but their judgment is in God’s hand. He said in Revelation that He is coming and his reward is with him, to give unto everybody according to the result of his work. You sang here today at the 20th anniversary of CCC, Elisha Parish, which is Prophet Marcus Tibetan’s parish. How would you describe Prophet Marcus? God calls those He wants to call, and those He call He chose and those he chose he glorifies their work and worth. He called Prophet Marcus and gave him a peculiar work, even you that you are interviewing me, the assignment God gave you I cannot do it. The assignment I am given, you cannot do it. So, the assignment given to Prophet Marcus, I cannot do it, the assignment given to me Prophet Marcus cannot do it. It is God that allocated our various assignments to us and called us for a purpose. He is the ultimate caller. “Even if I am on top of my wife, a song inspiration can just come and if I don’t write it down I won’t be okay. So, it is a natural gift and calling which has been given to me and that is why I sing the way I sing on stage”. Do you think we still have new hymns in Celestial Church of Christ? The faithful caused it, the founder Oschoffa said if it is possible, we should not be singing any other church’s anthem or songs but ours because the Celestial Church is the church that will cleanse the world. The Celestial hymns are very powerful and insightful but today most of the choirs in our various parishes sing worldly songs and that is the main reason why the spiritual songs seized coming. The spiritual songs have been withheld, the songs in heaven is multitude, just like the sand by the sea side but the habit of singing worldly and dirty songs in our various choir has stopped the spiritual flow of songs in heaven. If you get the church’s hymn book you will discover what I mean by that, most of Celestial songs were given under spiritual influences and there are still much to be given in heaven. Your songs are so philosophical, unique and insightful, how do you receive the inspiration for such? That is what I told you earlier on; your calling I cannot undertake and my own calling you cannot undertake. That is my own calling and it is not difficult for me, it just comes naturally, the moment I hold the microphone what I will sing will come. Even if I am on top of my wife, a song inspiration can just come and if I don’t write it down I won’t be okay. So, it is a natural gift and calling which has been given to me and that is why I sing the way I sing on stage. When you receive your song ministration, in which language do you receive them? Some come in English while some come in Yoruba language and it could also come in my dialect as well. God is a master of all languages but the most important thing is for you to jot it down because every song has its own message and every message has its own ministration. 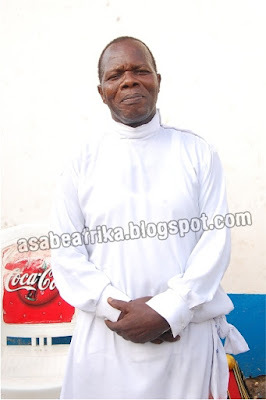 Are you from Benin Republic like Papa Oschoffa? I am actually from Edo state in South-South of Nigeria. I hail from a town called Ibillo near Auchi. My town is a border town because there is a border town between Edo and Ondo state in Ikare and there is a border town between Kwara and Kogi state at Okene-Lokoja. So, I hail from Edo state but you will never know except I tell you. You were very close to late Papa SBJ Oschoffa in his lifetime; can you share some of his personality trait with us? He was a man of excellence in his thought, in his walks, in his works and his mission. Oschoffa does not discriminate, he calls the Muslims our brothers and always advised us to welcome them into our fold and befriend them because we worship same God; he said it is one earth, one heaven and one raincloud. We even drink same water from the ground and we have the same rain falling upon every religion, there is nothing like Christian or Muslim rain. It is Oschoffa who taught us that Celestial Church must not condemn another church; it is a mandate by him because God owns all denominations. God is a dynamic God and his ways are equally dynamic. Or have you seen a day the thunder strike and went to kill a Cherubim and Seraphim member? Or have you seen thunder strike and go kill a CAC member? So, God owns all denominations and that is the basic teachings Oschoffa taught us in his life time, he taught us love and peaceful co-existence. “I don’t have a girl friend, I don’t have concubines; my wife is my only source of love. If to say I have like six concubines now and I have to service each and everyone of them, that is when I am bound to look aged and haggard because I might have over spent my strength and will be battling all kind of diseases. I will be looking like a bone”. There have been condemnations for gospel musicians who sing with worldly attires and praise sing celebrities, you as a veteran of gospel songs what do you have for people who now sing gospel tungba? Look, every one has his or her own peculiar calling and that is why you see things go that way. For instance, in the Celestial Church of Christ, we don’t drink alcohol, we don’t smoke and we don’t wear our shoes when we are on our Sultana dress. But members of Redeem Church drink, members of Winners chapel drink, there is how God has given grace to each and everyone of us, but a Celestial member is a called servant who must not go wrong with the church’s tenets and principles. Look at other churches and denominations, the pastor’s wife will be observing her menstrual period yet the pastor and his wife will seat in the altar, ministering to people and they still regard such altars as holy but that is not the case with Celestial church, a woman dare not enter the cathedral during her menstrual cycle and until 8 days when you will need to get yourself sanctified by a shepherd or shepherd assistant before you are allowed in, that is where Celestial Church of Christ is different and that is why we are called Celestial Church of Christ, a holy church from heavenly place. It is a rare and peculiar church. So, when you see gospel musicians who are to use their talent to praise God now using that talent to praise men and worldly things, maybe that is how they were called. How many years have you been singing sir? I have been singing on stage for the past 46 years. How have you been able to survive battles in the last 46 years? How many stories do we tell, how many experience do we share? Just like that my son, Olamide sang “Melo, meloo la fe wi, melo, meloo la fe so? (Laughter), it is only God that has saved us this far, we have faced so many battles and we have won so many. We only thank God for His grace. You see, the principle of our church is founded on faith, we don’t take pleasure in failure and we don’t look at past events. We only look at what comes forth. Of course as a singer, as a leader, I am bound to have seen it all in 46 years of performance and a member of this great fold. I am supposed to be a philosopher but what matter most is the ability to see God’s glory in every situation. Every life challenge is an opener into greater glory. Let’s talk about your high moments in music evangelism? There is one grace God has given to me and that is the grace of a good wife. Since I married my wife (Roseline) in 1972 we have not fought for a single day in the last 43 years of our marriage. She has never abused me for once and I have never abused her for once, I have never slapped my wife since our marriage, wherever I tell her to stand is where she will stand, she will never move an inch. That is the first grace and good luck God gave me in my 46 years of singing. Secondly, I have both male and female kids. I have two of my sons here with me today, they manage part of my ministry and you can see them there at the choir stead. And all my kids are graduates and doing well in their various fields. These are good things God did for me in His mercy as I yield to His calling. I am happy for all these, they are better than gold and rubies. 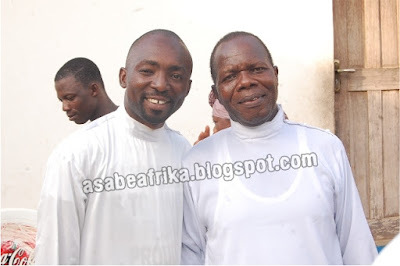 Can you recall some great moments you had with late Papa SBJ Oschoffa? Papa Oschoffa through the spirit of God revives the dead just like Jesus revived Lazarus, Papa will pray for the blind and his blindness is cast away. 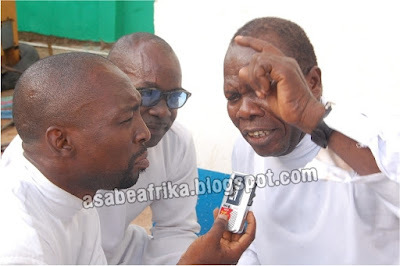 in fact, Papa do carry out spiritual works on Ogbanjes (Emere) and if he is casting out demons in a woman and the woman is far away at some ten kilometers away, she will start running down with no shame and until she gets to him, that is how efficient his power and spiritual gift is in his life time, even witches, you will see them falling and grinding their mouths on the floor, shouting and making all sorts of noise until the spirit is casted out. All these we witnessed at close range, all I can say is that God is the one that chose Oschoffa and empowered him; we cannot query God for giving him such a big and influential power. So, that is the power of Celestial Church of Christ and the glory remains there even 30 years after Oschoffa left. I can tell you many other things we observed with Papa Oschoffa but there is no time to talk today. Sir, you look so young and agile, how old are you? “My songs are for redemption, I was not given the talent to be praise singing people but I will sing for you and you will think deep and change from your evil way. That is my own talent and I am proud of my talent”. So, why are you looking so young? You walk fast and smart? It is simple; it is how you use your energy that you will meet gait. If you over use your content then you will be empty before your advance age. I don’t have a girl friend, I don’t have concubines; my wife is my only source of love. If to say I have like six concubines now and I have to service each and everyone of them, that is when I am bound to look aged and haggard because I might have over spent my strength and will be battling all kind of diseases. I will be looking like a bone. But when you adhere to your one and only given wife, then, you conserve energy and save yourself from crisis. I don’t womanize, I don’t drink and I don’t smoke.  Do you have a word for young and up coming Nigerian gospel artistes? My word for them is simple that they should fear the owner of their cloak. If you have chosen to sing gospel, sing gospel. If you have chosen to sing circular music, sing circular music. But, don’t deceive God; if you deceive God, you deceive yourself. God has no room for indiscipline; the Bible says ‘teach your children the way to go and when he grows that child will never depart’. It is a standard law. I don’t know how to praise sing people but it is quite unfortunate that today, if a gospel artiste has never praise sing a fan, he or she has not fulfilled her destiny which is a sad development because you are supposed to use that talent to uplift God, you are to praise sing God not man. In his life time, Papa SBJ Oschofa warned me not to ever praise sing him, that I should never praise sing him even in one line of my music; that, I should only praise God the one who send him and gave him the work. That was his standard principle and I followed it. 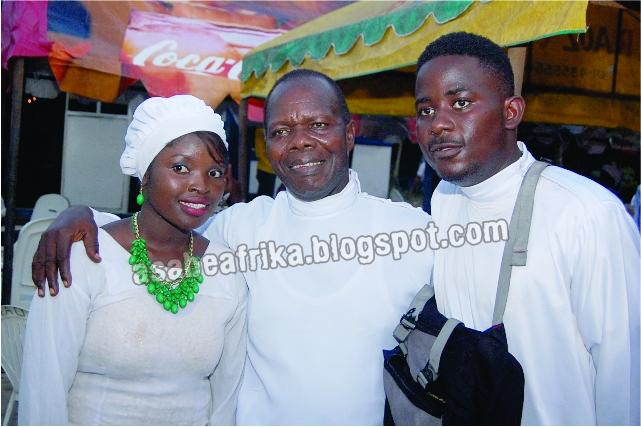 But the story has changed today; gospel artistes now praise ordinary people to make money. Maybe that is their own calling. Which of your song is your most favorite? I have so many songs and I can’t recall the one that I love most, like I told you, most of my songs come through inspiration from God. if I hold a biro in my hand for one month, I wont write anything but if the song want to come within thirty minutes, it will come down heavily and mightily and I will just keep writing until I download everything. There is none of my songs I don’t like. I have made several hits and till date people still listen to my songs. What is your perception of the ongoing Celestial Church of Christ crisis where everyone is fighting for the role of leadership; as one of the elders of this great church, do you think this is healthy? I will sing one of our hymns, “Baba joko sinu tempili o ma mi wo, ohun ti aiye yi n se” when the right time comes, those God wants to burn he will burn them and those God want to break into pieces, He will break them into pieces and He will re-direct His church. God is the owner of Celestial Church of Christ, one of our hymns said “Oluwa je ka mo wipe, ijo mimo yi tire ni” God is the owner of Celestial Church of Christ and nobody can compete for the leadership except God put that person there. That is it. Do you have hobbies and what are your hobbies? I like reading books, I read books on people and I read my Bible for inspiration. My next hobby is to watch the television. And my last one is to sing, I like composing a song. You see, there is a joy that comes with composing a song and bringing that song to live. It is like conceiving a new born baby and bringing that baby to live. My songs are like my own project and I think it is a rare gift to be a composer, you just sit down and something just drop a tune in your head and the words comes from your mind and you write it down and next is for you to record and before you know it, people start telling you that your song is healing or rebuking them. So, I enjoy reading, watching television, composing and singing a song. People also said your songs are always to admonish and rebuke evil deeds, and that you have never praise sang anyone before, why? Sorry, my dear, that is how I was sent. I am sorry for anyone who finds the messages in my albums too harsh, I cannot stop God’s message. Any one who is a thief if I sing a song to expose his atrocities, and he stops stealing that means my message has worked for him. If you are a womanizer and I sing a song to expose your act and you listen and becomes remorseful and change for better I am done with God because I have fulfilled my own part. My songs are for redemption, I was not given the talent to be praise singing people but I will sing for you and you will think deep and change from your evil way. That is my own talent and I am proud of my talent. In the past churches establishes schools and give free education to people but today, Pentecostal churches take free offerings from people to start schools and other educational facilities and make such institutions unapproachable for the children of even their own member, do you think this is Christ-like? Well, it is not new, the Bible already predicted it all, that in the end, that the perilous times will come. As it happened in the church that is how it happened in the choir, look at the music our choristers sing today, senseless music with no spiritual inspiration. You hear worldly beats being rendered inside the church. In our Celestial Hymn book, there are songs we are not supposed to attach a beat to but today, every song is a disco and fuji. The Church has invited Satanist intentions and enthusiasts into its fold; selfishness is the hallmark of today’s Christianity. In the olden days, teachers teach their students and flog them to read and pass exams but today, it is ‘Cash & Carry’ and you can see the results in our Youth economy. Are any of your sons taking over from you in terms of gospel music? Let me surprise you, all the Hymn songs I did from Volume 1 to the last volume, my children were my back-singers. There is no outsider that sang with me in any of the album. I consulted my band boys then and they charged me so much and my children said ‘What are these people going to sing that we cannot sing, daddy, we will help you?’, From Volume 1 to 7, my children are the ones who played the instruments and gave the chorus. So, God decided to use my family to achieve his aim. It can only continue from there and I hope this has answered your question. They should all do well and fear God, a Celestial Hymn said ‘before you get there (Kingdom of God) you will work, you will keep the commandment of God and love your neighbor like yourself’. When I travelled to London for ministration I just discovered that a lot of our people there don’t like themselves, a lot of them tell lies, two close friends will not call each other for a month which supposed not to be so, especially we Celestial members, we are children of same father, same mother but love has equally left us; the Celestial Church rule frowns at some certain things but our people have left the rule of the church for the rule of the world. They sleep with each other’s wives and exchange concubines at will, drinking, night crawling and all sorts of inanities. We are in the market place and we shall all go back home someday. The book of Revelations 22 verse 12 says “And behold, I am coming quickly, and my reward is with Me, to give to every one according to his work”. Beautiful article! I enjoyed reading it. God bless you Bro-Bro. God bless the Celestial Church of Church.